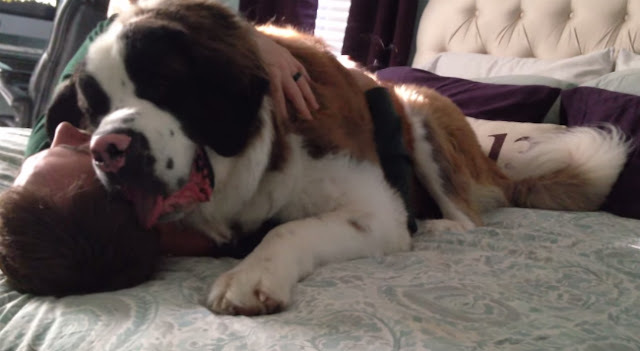 Sully, a giant Saint Bernard, is so excited and happy to see his owner that when he returns from work, Sully simply lays on top of him in order to grab his attention. At first, his father greets him and hugs him tightly. After a few moments though, he believed the enthusiastic greeting to be over. “Ok buddy, I’m going to get up now.” He attempts to leave, but Sully simply shifts his weight to stay on top of him. He won’t let him get up! Over and over he tries to rise, but Sully is so intent on giving his father as much love as he can that he simply cannot lift himself. 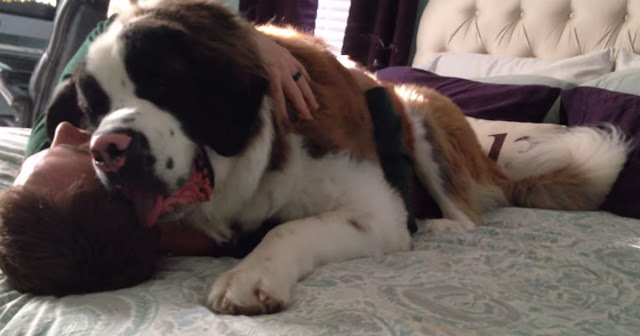 Every time he tries to move up or push Sully over, Sully simply uses his size to force his human to embrace him some more and give him kisses. After several more efforts, his father seemingly resigns to his fate and lies there while Sully nestles onto his neck. Sully eventually did let him up, but not until after he received one final huge hug!